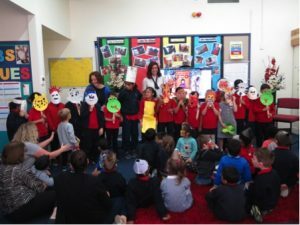 On Friday April 20, Furlong Park was delighted to host a very special event to celebrate the launch of an Auslan children’s story book, A Visit to the Zoo by Deaf authors Jen Blyth and Kerrie Taylor. 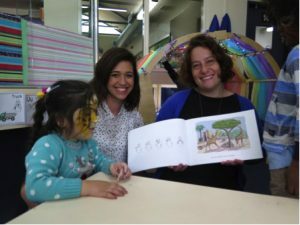 We all had a wonderful morning meeting Jen and Kerrie and learning about A Visit to the Zoo and the authors’ plans for the future which we hope will include many more bilingual Auslan story books! 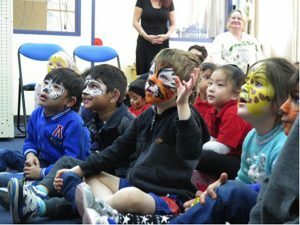 Children in the ELC had their faces painted for the occasion, while the primary school children dressed up as their favourite zoo animal. Furlong Park was rapt to share the launch event with so many of our families and friends including Roz Keenan, CEO of Deaf Children Australia, the authors’ families, staff from Aurora School and the Brimbank Weekly Star newspaper. A Visit to the Zoo is the first bilingual children’s book ever published in Australia where Auslan shines with beautifully illustrated signs full of detailed facial expressions by Shaun Fahey. The story illustrations have been lovingly crafted by Janet King.